Welcome to PART 2 of our complete beginner's guide to getting a six pack. In part 1 we discussed adjusting your diet to help. If you missed PART 1, you can go back and read it here. Unfortunately, your dream abs won’t show up just because you stopped eating chips. Though, that was a good start. And because you are now eating healthy, it should not be too difficult for you to exercise well. It’s the perfect timing for you to be physically ready as well since the next part is going to be all about working out. Here in PART 2, we are going to share with you the top five ab-related workout equipment you can use, five other exercise tools, and finally, other helpful accessories that can also help you in your fitness journey. Let’s get started with the top five ab machines. There are actually more than five ab machines out there. 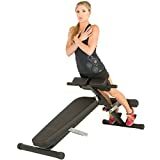 Because abs building is so popular, a lot of exercise machines have been invented already to help us in getting those perfect abs in the fastest and most efficient way possible. However, due to the limits of this post, we are only going to discuss the top five of them. They will not be listed in any order. 1. 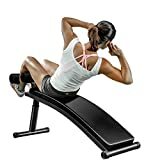 Sit-up Bench – The sit-up bench, also known as the abs bench, is one of the most commonly used abs exercise machines, that’s because it is very flexible and user-friendly. This is due to its adjustable angle, which sets the resistance of the machine. While more advanced users can go for a steeper and more difficult angle to work out on, beginners are advised to choose a wider angle. The one downside that some people think about the sit-up bench is that it is a one-trick pony. However, that is not entirely true! You can actually perform a lot of different exercises on it if you just know how to. 2. Pull-up Bar – Yet another commonly used exercise machine for building abs is the pull-up bar. Many exercise buffs prefer this because while it’s very easy to use and straightforward, it is still pretty flexible in terms of the different types of physical forms and exercises you can do with it. Another good thing about a pull-up bar is that you don’t really need to use the one in your gym. You can use the bars at the nearest playground, as long as it is sturdy enough to carry your weight. 3. Roman Chair – This exercise equipment can be a bit intimidating at first, and we don’t blame you. This is the reason why it’s recommended for (and more favored by) advanced trainers. The best thing about it, though, is that it works. It gets the job done. The downside is that if you use it without the proper form, you risk injury and major lower back pain. 4. 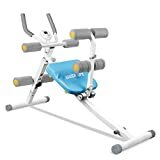 Abs Swing – The abs swing is one of the relatively new exercise machines on this list, but it’s already regarded as one of the most popular choices because it’s very easy to use. You don’t feel the resistance as much, but it’s working. That’s the thing, though. The downside of this machine is that you need to combine it with other ab-related exercises and diets for it to work. 5. Rowing Machine – The rowing machine is not the go-to machine when it comes to abs, but don’t underestimate this machine just yet. It offers a full-body workout, working 85% of all the muscle groups in the body. The only downside is that not all gyms have a rowing machine. Hence, if yours does have one, take advantage of it! Just to make our definition of exercise “tools” clear, what we mean (usually) are handheld tools used in exercising that are not machines. They come without settings and complicated gears, unlike like the exercise equipment we’ve mentioned above. 1. 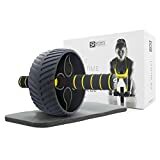 Ab Rollers – This exercise tool is usually listed as an ab machine because it really is a lean, mean, fighting machine when it comes to crunching those abs. While it looks pretty straightforward to use, don’t be fooled by this simple device. 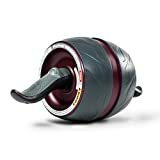 Although it looks like the offspring of a dumbbell and a wheel, it actually takes a lot of technique and form to make it work. 2. Exercise Ball – Here is another fairly simple-looking tool, the exercise ball. When used correctly, you’ll be crunching those abs in no time. In fact, you don’t even have to go to your gym for this because you can use it at home. This exercise tool is also so safe that it is even recommended for pregnant women. 3. Resistance Bands – Don’t need the help of machines for your abs bodyweight training? Why not level it up with resistance bands? Resistance bands, as the name suggests, improves the resistance, and thus, the effectivity, of your crunches, sit-ups, and other abs exercises. As for helpful accessories, these are the other tools that you can wear even when you’re not working out to still work on those abs while you’re not hitting the gym. 1. 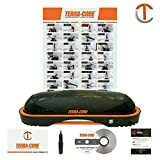 Abs Stimulator – There are already a lot of brands and models of this gadget, but basically, it is a belt that has a vibrating mechanism, which seeks to stimulate your abs even while you’re not working out. 2. Sauna Belt – Here is another extremely popular belt. If the other one seeks to build muscles, this one seeks to burn fat by making your tummy area sweat like crazy. A reminder, though, before we move on to the next part. These ab machines, tools, and accessories are not miracle workers. Without the help of a healthy diet and dedicated exercise, these guys won’t work. As what we have mentioned, these are accessories—extras—made only to give you an added boost. Now you have learned about diet and the right equipment, you are ready to learn more about exercise, which will be covered in PART 3 of this complete beginner's guide to getting a six pack. You can read PART 3 right now HERE.